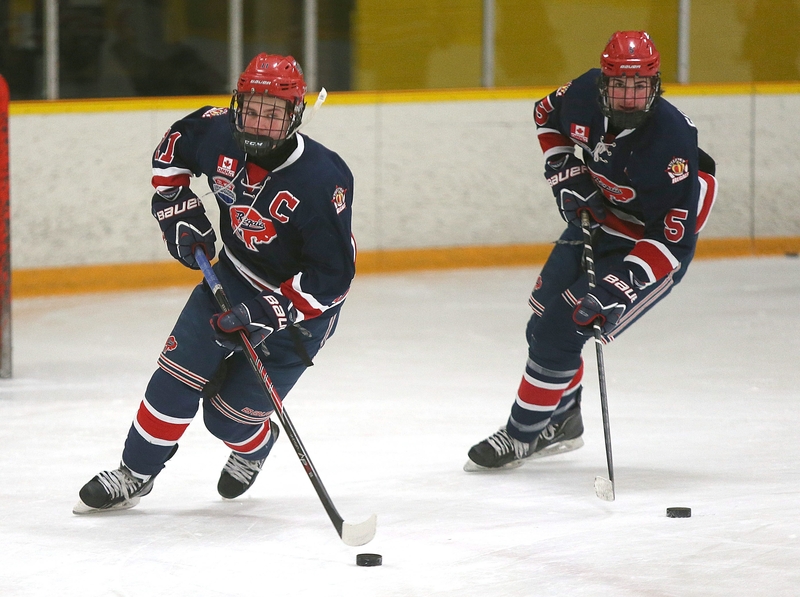 Forward Matthew Gasuik, left, defenseman Anthony Scanzuso and the Buffalo Regals look to keep the good times rolling in Green Bay at the USA Hockey Championships. It’s already well documented how Canadians feel when they lose to the United States in their sport. They can’t stand it. It stings worse than a slap shot off the foot. While the instances of American superiority on ice against Canada haven’t been as plentiful for Old Glory as they have been for the Maple Leaf, teams in the True North recently received reminders of what it feels like to come up on the short end of things against the red, white and blue. However, it wasn’t an American national team dishing out the serving of humble pie; Team USA’s colors just coincidentally happen to be the official ones of the Buffalo Regals. The organization made history this season at the expense of its neighbors across the border. The Brian Gasuik-coached Regals 14-under boys squad became the first American team to win the Ontario Minor Hockey Association based South-Central Triple A Hockey League. The 14-under Regals didn’t just make history. They did so in dominating fashion as they cruised to a 32-4-4 record in the league. They’ve outscored teams on average of 4.93-2.01 per game en route to an overall record of 63-8-5. “It’s kind of a punch in the face to the Canadians, first ever American team to win their league,” said team captain and leading scorer Matt Gasuik. As impressive as that is, winning the SCTA wasn’t even the ultimate goal for these Regals. It’s winning the national championship that matters most to them. They begin pursuit of that Wednesday in Green Bay, Wis., during preliminary round action at the USA Hockey championships. Buffalo, ranked ninth nationally, opens against No. 1 Shattuck St. Mary’s at 11 a.m. The Regals’ 14-under team will be in a tough grouping during its 16-team tournament. Buffalo will be in a four-team division that also includes No. 6 Wisconsin, with the top two finishers in each of the tourney’s four divisions advancing to Saturday’s playoff round. Nonetheless, the national title has been the ultimate goal, even though the Regals went into the season looking to achieve four benchmarks. So far they’re 3 for 3 as they won the Warrior Tournament in Detroit, won their own Super Series Tournament that featured the top 12 teams in the country and, of course, the SCTA crown. That’s the secret to the Regals’ success this season. It’s about team, not individuals. Sure, there are plenty of tall, skilled, fast players on this team but they’re not freelancing during their shifts. They’re doing the little things that need to be done for a team that puts winning ahead of everything else. That’s why they’ve limited opponents to 153 goals. That’s why there are 10 players on the team who have scored at least 20 goals, seven who have recorded at least 33 goals and five players averaging more than a point per game. Matt Gasuik (55 goals) and Erik Urbank (62 goals) lead the Regals in scoring with 118 and 116 points, respectively. Christopher Blachowski has 34 goals, shares the team lead in assists (63) with Gasuik and has 97 points. But on this team those players along with Dylan Seitz (45 goals), Harrison Craffey (40 goals) and Colton McKenna (37 goals, 66 points) are just as vital to success as Jack Vanderbosch (seven goals, 18 points), Ryan Riter (six goals, 23 points) and Ryan Sidorski (six goals, 17 points). It’s not about stats. Justin Stotz and Joseph Samplinski have split goaltending duties. Including newcomer Brandon Hausler, who has 33 goals and 33 assists for 66 points. Hausler’s family lives in Houston, but he does have family ties to Western New York and is staying here with his grandmother. The Regals quickly made him feel at home. “They’re honestly like my second family,” he said. “I think every kid on this team can say that. We’re really close on and off the ice. Other members of the team include Jack Millar (20 goals), Danny Smith (21 goals), Mike Olezewski (21 goals), Joe Zanghi (12 goals) and Andrew Froman (17 goals). The 14-under Regals were the first from the organization to win an SCTA playoff title, but they’re not the only one. The Terry Miller-coached squirt team also had a banner season, becoming the second American team to win the SCTA playoff championship, capping a 31-5-4 regular season with a 6-0 playoff run to the crown earlier this month. Buffalo secured the title with a 3-2 overtime win over regular-season champ Burlington. The Regals also beat Oakville, 3-2, in the semifinals in triple overtime. The 10-under Regals finished 47-12-6 overall, yielding only 101 goals. They also won the Hamilton Bulldogs and Intense Milk Classic tournaments. Members of the team include: Ty Broad, Ryan Coyne, Joe Tobia, Riley Kubiak, Connor Miller, Brett Veiders, Jak Varawerk, Luke Braun, Sam Christiano, Ryan Young, Tristan Weigand, Dom Derenda, Joe Blackley, Jacob Napier, Michael Milosevski, Matthew Alberti, Christian Greaves and Trent Kubiak. Assistant coaches include Jon Braun, Kevin Coyne, Steve Christiano and Pete Dudek (goalies). The Regals’ 14-under team is one of two Tier I boys teams from the area vying for a national title in Green Bay. The other is the 16-under Regals/Jr. Sabres team. In Tier II, the 18-under Clarence Mustangs will open nationals against Team Ohio on Wednesday at 10 a.m. in Wayne, N.J.
On the girls side, Northtown Center at Amherst hosts the Tier II nationals. Amherst has participants in 14-under and 16-under while the Buffalo Stars will vie for the 19-under crown. For Tier I girls, the Regals will compete for titles in 14-under and 16-under along with the Bisons’ 19-under team in Marlborough, Mass.